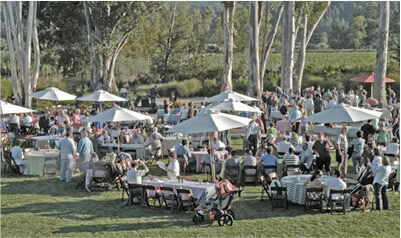 The Pestoni Family invites you to taste our wines, stroll through our gardens and enjoy a picnic. Our tasting room is open daily 10am to 4:30pm, excluding major holidays. Reservations are required for groups of 5 or more. Reservations for our picnic grounds are required. Please call 707-963-0544 or email hospitality@pestonifamily.com to request a reservation. A selection of four current release estate wines. A flight of five wines, includes a comparison tasting of our Rutherford and Howell Mountain estate Merlot and Cabernet Sauvignon. A private tasting designed for small groups, either in our Legacy Barrel Room or in our gardens. This can include current releases, vertical tastings and library wines. Contact hospitality@pestonifamily.com for pricing and details. Please reserve at least four days in advance. Picnic tables are available for use after enjoying a tasting flight in our tasting room. Picnic table use is complimentary for our wine club members. Reservations are required for groups of 5 or more. Please contact events@pestonifamily.com for availability. Pestoni Family Estate Winery is a perfect place to host your next event! We offer private group tastings & picnic lunches. Our outdoor venue can accommodate just about any size group for lunch or dinner. This is an ideal spot for a corporate event, family BBQ or a formal sit down dinner under the stars. Please contact events@pestonifamily.com for more information. SORRY WE ARE CLOSED FOR A SEISMIC RETROFIT. The Pestoni Family welcome you to the Napa Valley and Calistoga. Hotel d'Amici offers a unique package of wine tasting and lodging. Owned by the family, the newly renovated Hotel d'Amici is located in historic downtown Calistoga on Lincoln Avenue. 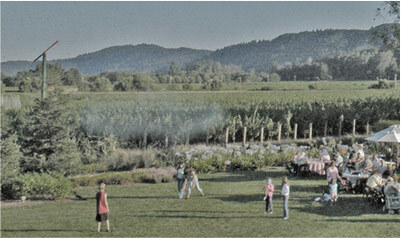 Many fine restaurants and world famous spas are within walking distance and numerous wineries are a short drive away. Much care and consideration has been taken by the Pestoni family, staff and management of Hotel d'Amici, to insure that your stay with us will be truly wonderful, relaxing and memorable. We hope you will enjoy our delightful little hide-away, and that you will share some good times with your friends or family away from the fast pace of your world.